What I love about staying in B&Bs, as opposed to hotels is that they all have their own peculiarities, characters and ways of doing things. At first things seem a little odd but then as you have a sleep, shower and breakfast a certain sense of ownership comes with the territory and you feel quite at home. 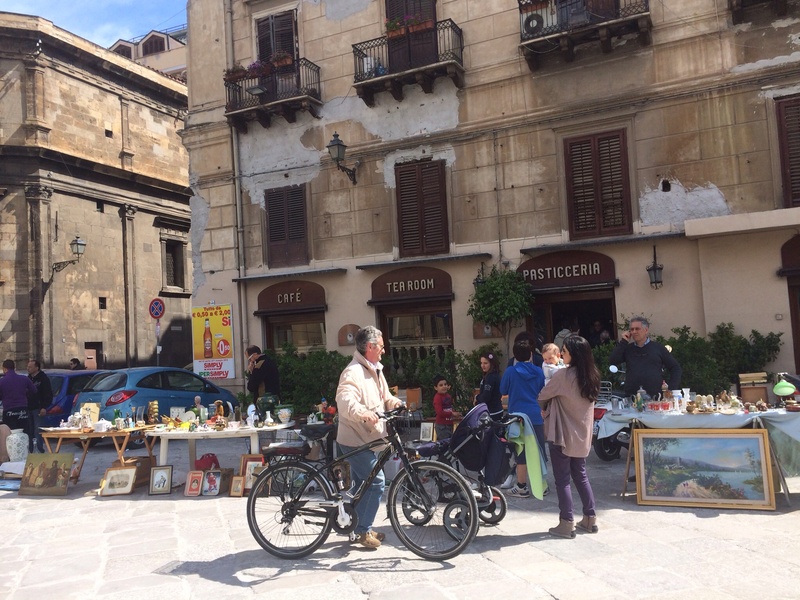 We bravely hired a car at Palermo airport and with the help of the TOMTOM on my iPhone we drove into this ancient city. 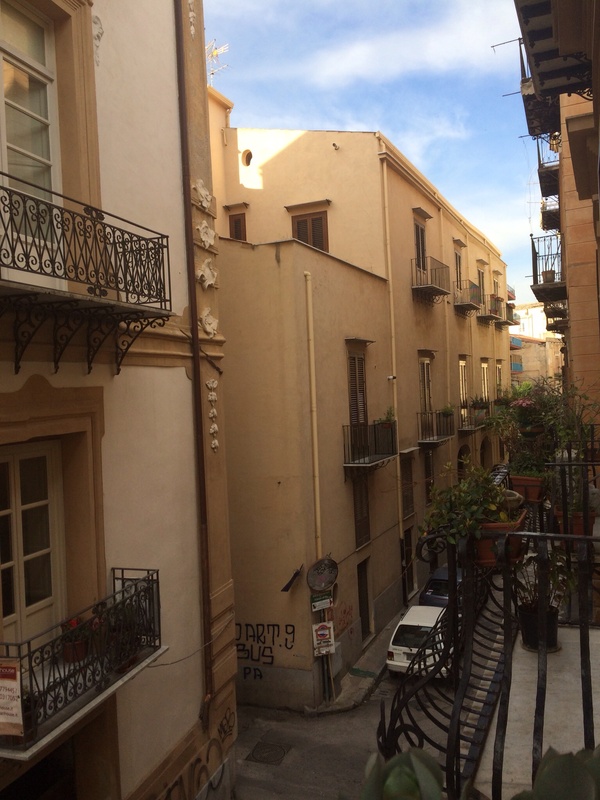 With all the one way streets there is no way we could have reached our B&B in the heart of the old part of Palermo without our navigator friend. On reaching the Piazza a couple of little boys helpfully showed us where there was a free space and after witnessing the shortage of decent spaces nearby, this is where the car will stay until we leave tomorrow morning. 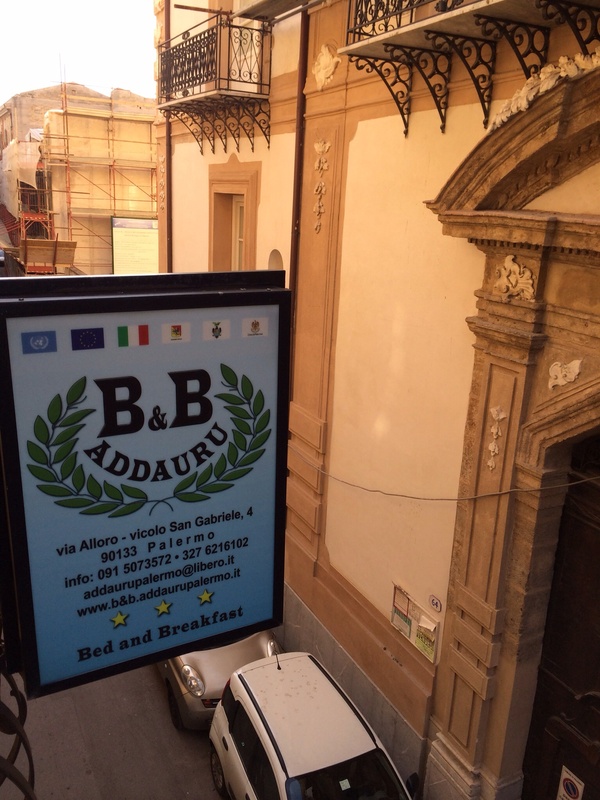 After settling in to our B&B with the help of our gorgeous young hosts, Lucia and Giuseppe, we went for a stroll at about 9.00 pm to find somewhere to eat. The place was still alive and buzzing with people sitting in the lanes laughing, talking, eating and drinking. 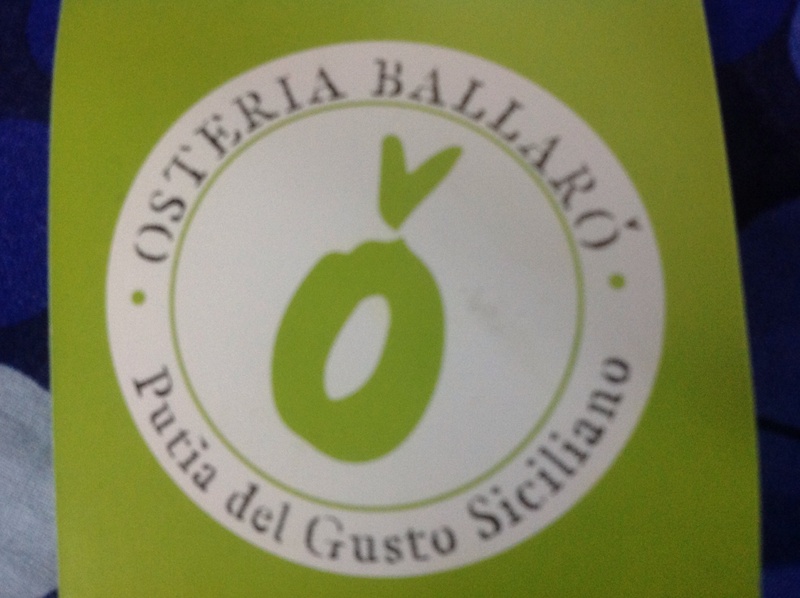 We happened upon a busy restaurant/bar called Osteria Ballaro which advertised itself as cooking street food, which we took to mean, traditional dishes of Sicily. What a great choice we made! After travelling since 9.00 am by train from Sorrento to Naples, Naples to Rome, Rome to Fiumicino Airport and then by plane to Palermo we were tired and wanting good basic food. The owner is very involved with all that happens and this place is obviously a labour of love for him. I had the lentil soup and my husband the slow cooked beef. We had chargrilled vegetables and the most beautiful bread that tasted slightly spicy. We are going back tonight to try the seafood. This morning we wandered around the town to see the sights and soak up the character and atmosphere of this busy city. There are so many buildings from different eras that we are starting to become blasé about the history that surrounds us. Thank goodness for the internet so we can brush up on the likes of Victor Emmanuele II and Garibaldi. 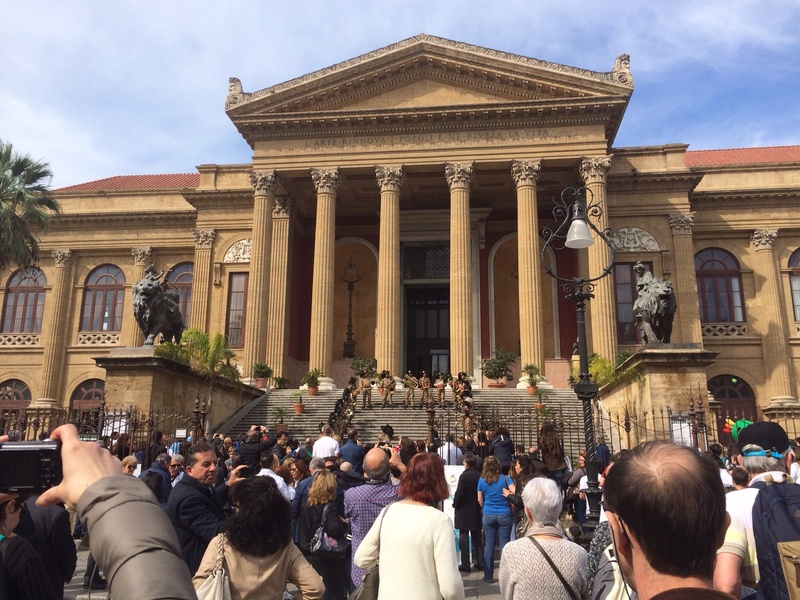 At the Teatro Massimo crowds were gathered as different schools from around Sicily appeared to be having ‘chant offs’ on the Teatro’s steps posing with a funny looking green and white character that looked like a soccer playing rooster. I have searched and searched but cannot find out what it was all about. The icing on the cake was when a brass band dressed in camouflage gear with long glossy black feathers adorning their headgear, marched, ran and played in perfect unison some nationalistic sounding tunes. They were very entertaining. This afternoon we took a couple of buses to the medieval town of Monreale. It was interesting but no more so than Palermo itself. The Cathedral was the centrepiece. Unfortunately the Art Gallery was not open. Sunday afternoon is not the optimal time for a visit. We are looking forward to our dinner tonight. Tomorrow we are off to Agrigento via Segesta.